This is a place for any extant garments in private collections from about 1941 back. There is no beginning date. The only rule is that it can't be currently in a museum and must be before the bombing of Pearl Harbor. I mostly post items I've seen on ebay, etsy, or other auction sites so we will continue to have a record of them for research purposes. 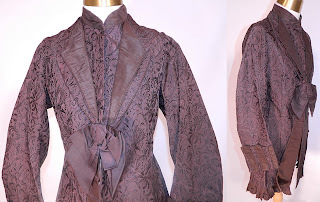 If you have antique clothing in your collection, please, email me pictures of them and I will gladly add them to this site. This antique Victorian era brown silk damask brocade bustle back pocket bodice jacket dates from the 1880s. It is made of a dark chocolate brown silk damask brocade fabric, with a decorative rococo artistic design pattern and pleated brown silk trim edging. 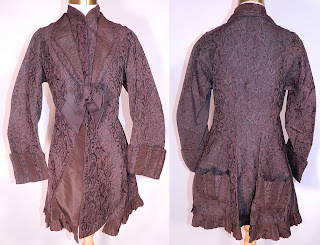 This beautiful bustle bodice jacket traveling coat is a long mid length, has a high band neck collar, fold over lapel, layered front, with hidden button closures, brown bow ribbon trim, long full sleeves with large rolled cuffs, a fitted back with bustle drape, large patch pockets and is fully lined inside. 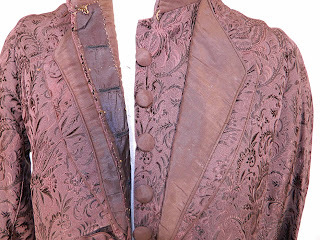 The jacket measures 31 inches long, with 50 inch hips, a 30 inch waist, 34 inch bust, 10 inch back and 23 inch long sleeves. It is in good condition. This is truly a rare and wonderful piece of antique Victoriana wearable art! 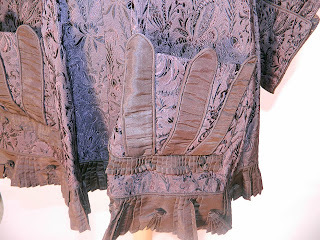 ...Is it just me or does it look like a three fingered glove wearing monster is trying to grab the wearer's backside? Poor bling placement, clearly not a new idea.